Herefordshire in general has a long and distinguished tradition of agriculture with worldwide prominence being achieved by its eponymous breed of cattle, Red Streak cider apples, unique perry pears and distinctive hop yards. Our small parish of Putley in particular has further claims to apple growing eminence as within our bounds are six family owned fruit farms. This proliferation of trees which includes apples, pears, plums, cherries and quince makes Putley a magnet for those interested in the best available orchard produce. The reasons for the fruit growing spreading are many and varied. There was a Roman villa in the village and a Roman road runs just to the east – we can harbour visions of Romans refreshing themselves with local Putley wine. Our gently sloping south facing land is sheltered from cold winds by the Malvern Hills to the east and Bromyard Downs to the north. The Black Mountains to the west provide a Rain Shadow Effect which means that our annual rainfall is about 600mm with about half that falling in the summer – ideal for fruit growing. The Marcle Ridge, also to the west, provides an even better micro climate and its tree lined edge is a wonderful natural wind break. The rich red soil is derived from old red sandstone which weathers to produce a deep moisture retaining soil which, when sympathetically worked and managed, provides a wonderful tree growing medium. These natural advantages combine with a tradition that has evolved from small standard orchards on mixed farms to commercial orchards planted by Squire Riley, who owned the Putley Court Estate in the late 1800s. The coming of the Railway also opened new markets, especially London, the Midlands and the North. 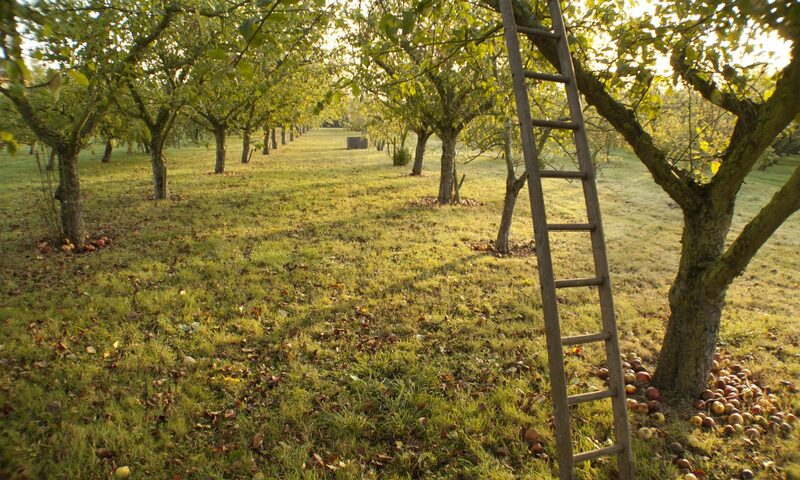 The Squires fruit growing legacy meant that, when the Estate was sold after the First World War, Putley was in a strong position to continue this husbandry and that culture continues, thrives and still develops to this day. Throughout the Parish are remains of cider mills and presses, with the best example being at Lower Court, next to the Church. Here cider and perry was made for the Estate, while just across the Church Meadow was the mill where cereals were ground into flour. This cider making tradition has now been revived by Once Upon a Tree, producing Award Winning Cider and Perry at Dragon Orchard in the heart of the village. The quality and flavours that you can now taste and enjoy amply reflect the natural advantages of the area which produces quality fruit and turns it into outstanding flavours. The ancient arts of the skilled cider maker coupled to modern methods of hygiene and innovative new techniques enable you to enjoy the true taste of Putley.